I've been looking back recently at my deviations and notice that my attention has veered away from Proto-Indo-European for quite some time as I obsessed over the separate topic of all things Etruscan, Rhaetic and Minoan. No particular reason for this, really, it just happened that way. Sometimes one's learning journey can be quite meandering like that, much like a spider weaving her web, connecting the dots of a large area, slowly filling in the spaces one thread at a time. Recently though I came across something that gives me cause to come back to that topic. Lumping words for 'lion' in with 'hair' is just too easy so, rejecting the Tocharian outliers, we are left with what was surely the only real impetus for the comparison, Latin and Sanskrit. Yet it's not enough to compare look-alikes blindly and many things need to be considered at once - sparse evidence, the unanalysable grammar of the root, the suspicious presence of rare *a, etc. This alleged root then remains more a set of questions than a single, decisive answer. Because of this, I for one don't accept it as part of genuine Proto-Indo-European vocabulary. A better solution to explain these terms seems to involve non-Indo-European substrate. Simultaneously, Proto-Aegean *zira 'hair' (presumably from Old Egyptian *θīra 'hair, thread', later written sr) explains away Greek kithara through Minoan *ki-zera 'three-stringed', exactly parallel to Persian seh-tar (سه تار), Chinese san-xian (三弦) and Japanese san-gen (三絃) which all mean the same. That Greek term has long been suspected to be a Minoan term anyway so I'm not saying anything terribly deviant. I can only expect that the proper reflex in Etruscan is *zir /tʃir/ which looks nice beside Latin cirrus 'tuft of hair, a lock, a curl' whose etymology otherwise appears unknown. 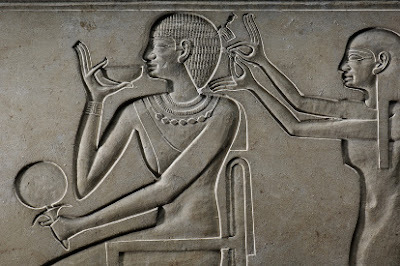 And so, addressing the unlikely PIE root above, in light of our collective ignorance on the matter, would it hurt to suggest an Aegean alternative, something like **kai-zera 'hair on head', for consideration? Pokorny, Indogermanisches etymologisches Wörterbuch (1959), *kais- (see link); Wyatt, Indo-European /a/ (1970), p.31 (see link). Upon some reflection, it's of course possible that, under the revised notation, the [a] is a uvularized allophone of *e in underlying *qeis- (ie. traditional "vowel colouring"). Nonetheless this helps naught in explaining its derivation. 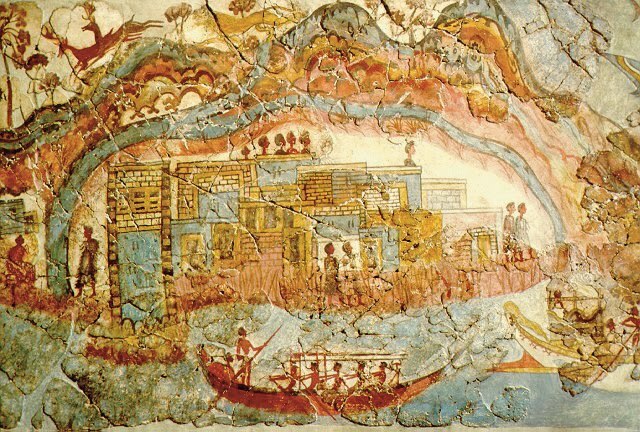 Andras Zeke deserves a shout-out for his latest post at Minoan language blog called What do the Minoan Linear A tablets tell us about Cretan geography? - Part II. He characteristically goes to a lot of effort and detail to explain the texts for us, noting all the difficulties and possibilities. While PA-I-TO, written in Minoan Linear A script, is easily linked with the famous town of Phaistos, many other towns listed in these ancient accounting records are far more tricky to identify. As I might have mentioned before, each and every word in a vocabulary of a particular language is in itself a universe of details. Details about origins, usage, semantic shift, etc. Each word can give us a little history lesson if we're willing to devote the time and focus. Another universe unraveled itself upon coming to my latest examination of Aχratina which is attested in TLE 930 with two case endings chained to the end in the form Aχratinaliśa, conveying the ancestry of the person in question. Transparently Aχratina can be broken down to mean 'of *Aχrate' by way of the productive suffix -na. In turn, this implicit base *Aχrate ends in the ethonymic -te suggesting a meaning of 'someone from *Achra'. Is there such a place though? Indeed there's a perfect match in a Sicilian town which the Romans called Acrae and which the Greeks knew as Akrai (Ἄκραι < ἄκρα 'height, hill-top, citadel'). One would therefore surmise from the above that the Etruscans approximated that name as *Aχra. 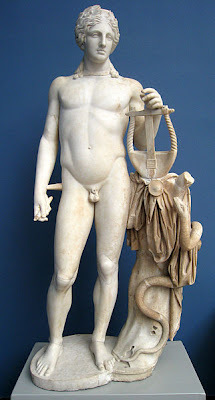 I'm going to indulge in more speculation based on Why would Apollo play a lyre?. 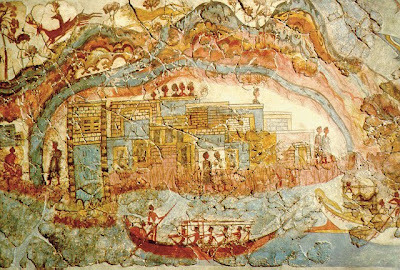 I notice a connection with my previous etymology for 'kithara', a relative of the lyre, which I've been reconstructing lately as Minoan *ki-zera 'kithara' (= /'kitserə/). The word must literally have meant 'three-stringed', if we extrapolate both Minoan *ki 'three' and *zera 'hair, string', the former word being cognate with Etruscan ci 'three' and the latter being an Old Egyptian loan as I mentioned before (cf. Egyptian sr). With the aforementioned etymon, *lura 'lyre', as well as the many other possible "Pelasgian" terms like συβήνη 'flute-case', it strikes me that Mycenaeans had been embracing Minoan musical tastes en masse. So here's a further question. Do the three strings of the lyre, the instrument of Apollo himself, express a deeper solar symbolism? Could it be possible that the three strings point to the three seasons of the year, for one? This implies a connection between the notion of 'thread' and the notion of 'time'. But wait, where have I heard of this before? A little digging triggered my taxed memory. The mythical Moirai or Greae, otherwise known as the Fates, show clearly that indeed a 'thread' is symbolic of at least a human lifespan since they are said to have "cut short" the lives of mortals at their appointed time. Further, it turns out, Diodorus Siculus directly affirms that the three strings of the lyre represented the three seasons! It all paints a fascinating ancient theme intertwining, strangely enough, music theory with religion. Returning to this hypothetical *ki-zera, it's alluring to give it an added metaphorical meaning of three 'threads' or 'ages' of the year. There's another theoretical Minoan term I've suggested before on this blog, *ki-amaira 'three-faced' which would serve as the original title of the reknowned Chimera (see Paleoglot: The Chimaira chimera). Again, the three 'faces' appear to refer equally to both the three seasons and the three parts of the day interchangeably. Indeed, it is already proved that even the periods of the day are yarned into the notion of age in the famous Riddle of the Sphinx dating from classical times. These ancient notions are woven together brilliantly into an endlessly fascinating fabric. The historical library of Diodorus the Sicilian (1814), chap.I, p.23 (see link): "He first found out the harp with three strings, in resemblance of the three seasons of the year, causing three several sounds, the treble, base, and mean. The treble to represent the summer; the base, the winter; and the mean, the spring." Why does Apollo play a lyre? It seems like a simple question but mum's the word online and even Wikipedia doesn't help although it does touch on the iconic lyre in its current draft of the Apollo article. To me, it's most likely that the deity of the sun isn't given a stringed lyre due to anything more elaborate than a word pun in some forgotten tongue. Which one, when, and in what way are the remaining questions. In fact, the ultimate source of the word 'lyre' is still a riddle. The etymology of Classical Greek λύρα, from whence the English word, is uncertain but most often suspected to originate from a non-IE language, most probably Minoan. Note that the word dates back to Mycenaean, as attested in Linear B ru-ra-ta-e = *lūrātāe '(two) lyrists [dl.]' so it could very well be a borrowed word from the Minoan language. So I hypothesize a Minoan form *lura 'lyre' as the most credible source. Coincidentally I've already been interpreting lursθ in the Lead of Magliano as a proper intransitive participle of a stative verb luras 'to be bright'. Within its context, Tins Lursθ would be the genitive of an epithet meaning 'Shining Sun' pointing to the highmost one, Tinia. Inscription TLE 747 also attests to lursl, a type-II genitive of its corresponding bare deverbal noun, lurs, which would then imply 'light'. Since -as- seems to be a fairly productive derivational suffix in Etruscan verbs (possibly a stative marker) I anticipate a more active root, *lur- 'to sparkle, to shine', at its base. This latest revelation has got me wondering if there is a connection with this sun-lyre motif. Given both *lura 'lyre' and *lura- 'to sparkle', there would be natural temptation to use the 'lyre' as a creative solar symbolism. Of course, I still need to investigate this further and make sure that these translations are solid but it's one tempting thought that has me itching for more data. Past Horizons has published Life and Death of an Etruscan Settlement, discussing the archaeology in Casa delle Anfore and what's been found. The 3D reconstructions are very helpful in giving the reader a clear picture of its past. Just beware of the archaeological hard-sell so common in this field. The author feels the need, it seems, to begin by over-hyping the significance of the site as the means to solve the "origin mystery" of the Etruscans that seriously no longer exists. "Whilst some believe [Etruscans] were an ancient race from the heartland of present day Tuscany, others trace their origins to northern Europe, and recent DNA analysis suggests validation of the claims of Herodotus." Nonetheless the site is certain no matter what to give us more answers on a fascinating civilization and there are plenty of newer mysteries to keep our minds busy.